"There was a lady waiting especially for us to arrive bless h..."
Have a question for Ala's Green Lagoon Hotels? "Nice spot in the rice fields." "Breakfast was super delicious and there was always fresh coffee and tea on our patio." "The pool and balcony were gorgeous and overlooked rice field..."
Located in the middle of a rice field of Ubud, Ala's Green Lagoon Hotels offers accommodation built in a traditional Bali style with brick and stone walls, featuring outdoor pools where the overlooking views of the surrounding rice fields are provided. 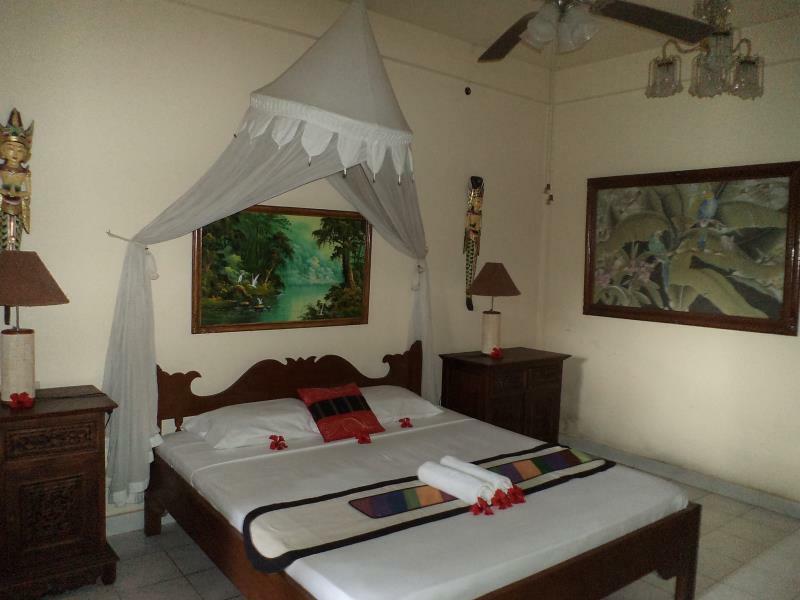 Due to the guesthouse’s key location, guests are able to reach two main attractions in Ubud - the Palace and the main market - and the Monkey Forest within a 10-minute walk. Bali International Airport is a 75-minute drive away, and staff can organize transport for guests. 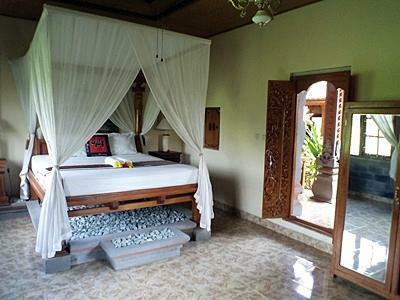 At Ala's Green Lagoon Hotels, rooms are tastefully decorated with made-in-Bali furniture. As the place offers guests the opportunity to experience pure nature, all rooms in the main building have a ceiling fan, a mosquito net, and a private balcony or patio. There is also cottage accommodation located in its own garden about 100 meters away from the main guesthouse. Inside the cottage, air conditioning and a private balcony or patio are provided. Meet useful facilities and services offered by the guesthouse such as Wi-Fi, relaxing massages, and a friendly service from reception where the staff can arrange trips to Ubud and Bali’s main sights. Every morning, a free breakfast can be served in guestrooms or by the pool. If you are looking for an affordable accommodation with a natural atmosphere, Ala's Green Lagoon Hotels is an ideal base to spend a perfect stay in Ubud. "The room itself was beautiful and very clean." Great guesthouse. Nice spot in the rice fields. Room was a bit hot and the fan didn't work properly but the owner offered a plug-in fan and it got a bit better. Breakfast was super delicious and there was always fresh coffee and tea on our patio. Would recommend! Peaceful, country feeling out in the rice field, but just a short walk to town. Fabulous breakfasts included with a big selection. Being treated like a member of the family. I have stayed in Ubud three times in the last five years. The first time I was booked into a different guesthouse. It was okay, but looking around town I decided to go better. So I spent a day walking around until I came to Jalan Bisma. I noticed all the pretty buildings out in the fields amd walked down the path until I came to the last one. I walked in and looked at the Green Lagoon and knew I had found my home. I have spent seven happy weeks there on the three occasions. Everything was great. We had a kind of crazy stay with an injury almost immediately after arriving and one of us on crutches. The staff was very accommodating, going so far as to provide rides to the doctor. The location is great--just removed enough to offer a peaceful sleep and close enough to be a 10-15 min walk to the main palace/market. Also, the breakfast is fantastic. Drool-worthy. Nom. Location, great staff,clean and well maintained. I was more than happy with the hotel,and extended my stay by 3 days,the Internet in my room was not good ,but outside it was fine . Ala's Green Lagoon is a perfect place in some minutes walk distance of the busy part of Ubud.You walk in to the rice field in a tiny road, the hotel is in the middle of the ricefields, with beautiful garden, many flowers, and nice swimmingpool.We arrived very late at night in Bali and they offered us a transport to the hotel.So we were picked up from a very kind man with that cute balinese clothing from the airport.It was about 1 or 2 pm, when we arrived everything was closed but they could give us, what we needed, water, beers, etc. 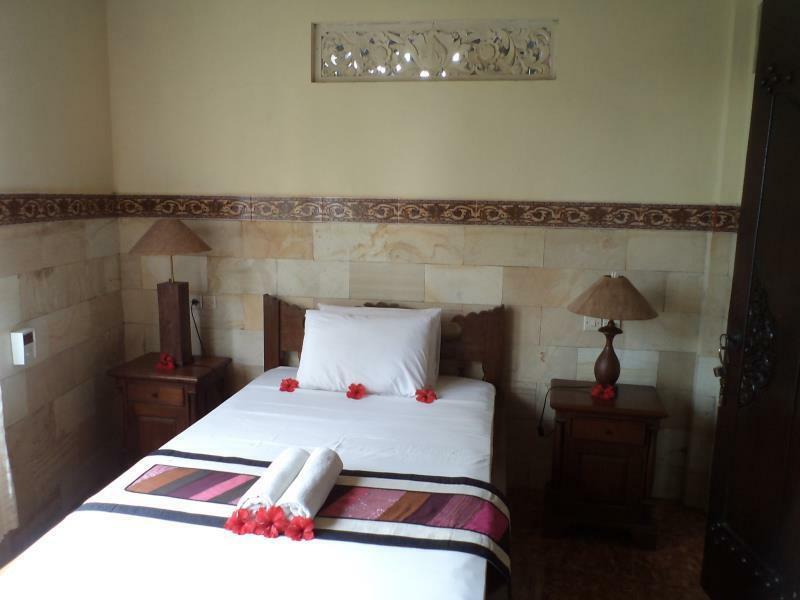 The room is amazing, in typical balinese style, you feel as you were in a temple, decorated with flowers everywhere. The breakfast was delicious, the green pancake and the jaffle was my favourite. However they don't have restaurant the owners wife can make nice balinese food if someone asks for. The staff is friendly and helpful, you can rent motorbike for good price and they can organize you transports and tours. The whole place is quiet,pieceful and very clean as well, the swimmingpool has a beautiful view to the ricefields.We loved to stay here, I would highly recommend it. 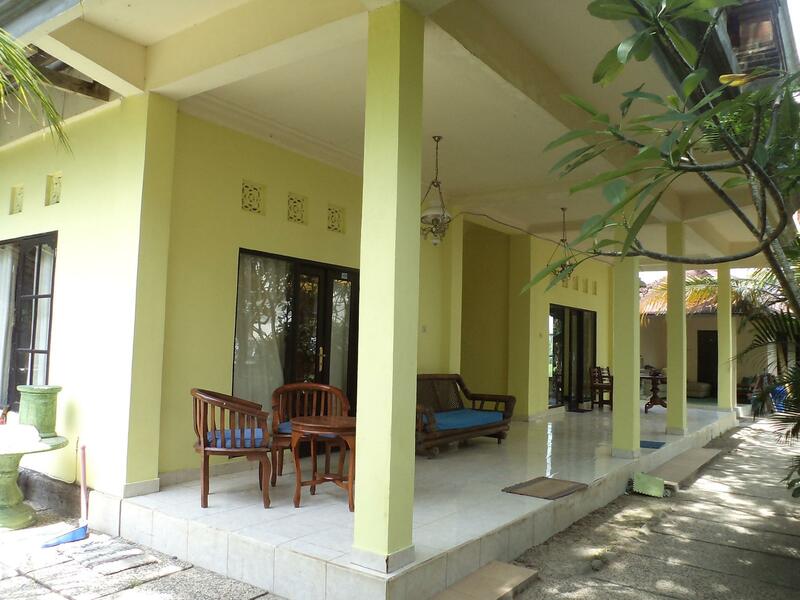 Situated right in the middle of the rice paddies just off the busy road in Ubud. Little bit tricky to find but easy and quick to walk to the centre of town once you know the way but far enough to feel like you're not in the city at all. Pool and view were lovely as was the room decor. Felt like staying in a small temple! the hotel's location is quite good in that it is pretty close to the centre of the town but beware: it is off the main road so cars cannot come up to the door - you have to walk for some minutes on narrow paths in the rice fields. it's a very nice walk but may come as a nasty surprise if you arrive with a lot of luggage you have to carry yourself. the place itself is very beautiful: large rooms in the traditional balinese style (carvings and all) in a garden on the verge of rice fields. the rooms are clean, the mattress on the bed is comfortable although the bed itself is on a kind of a pedestal so you have to be careful climbing in and out. there is a huge stone tub in the large half-open bathroom (but they provide no toiletries whatsoever, no even soap). working wi-fi. breakfast is quite limited. the owners can arrange day trips with english-speaking drivers at fair prices. We loved the room that is a standalone, large space with very nice furnacings; amazing entry door. Staff is excellent and helpful in everyway; they arranged our tour, transport to airport and rental of motorcycle. The best massage (Dana's is nearly next door). The swimming pool was nice to relax. Restaurants are very close by; within a short ride. Friendly staff, small swimming pool, great choice in breakfast. Away from the busy streets of Ubud, you have to walk over a few small paths to get there. This is a plus if you're looking for a peacefull place. The swimming pool is clean and so are the rooms. Choice in breakfast was to my liking and always in good portions. Prices are moderate. Rooms are simple but clean. We had 2 rooms for 4 people, ages between 55 and 82. Size and presentation of room, like staying in a temple. Fan kept mozzies at bay. I booked in for 3 nights and stayed for 7 more. Its best feature is that it is close to Ubud's main street and facilities but off the road, quiet (the only noise is from frogs and crickets) and opens onto rice fields (a plus if one is prepared to ignore the sacrifice of arable land....). It also has free and reliable wi-fi.